Pseudomonas aeruginosa produces exotoxin A, which is a virulence factor.This exotoxin inactivates ADP ribosylation eukaryotic elongation factor 2( EF 2) and thus interferes with protein synthesis leading to cell death.Aeruginosa also produces an exoenzyme ” Exo U,” which damages the cell membrane leading to membrane lysis and cell death.... ABSTRACT: Pseudomonas aeruginosa is the leading pathogen in cystic fibrosis (CF) lungs. Since there is great concern about clonal spread in CF centres, this study examined the P. aeruginosa genotypes of colonised residents of a CF rehabilitation centre. Pseudomonas Media and Tests By: Jvo Siegrist, Product Manager Microbiology, enumeration and cultivation of Pseudomonas, using its biochemical characteristics, including Gram staining kit, and many types of selective growth media (Table 1) and diagnostic tests (Table 2). 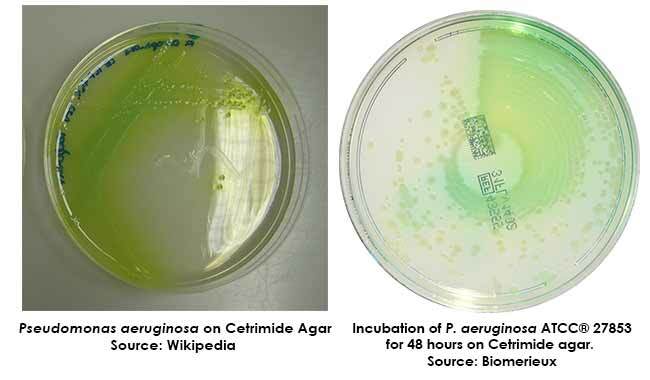 Additional information on media and tests for Pseudomonas and a wide range of other microbes can be found on our web site combine pdf every other page multiple times Pseudomonas aeruginosa (center) is a nonfermenter. The end product of glycolysis is pyruvate. Organisms that are capable of converting pyruvate to formic acid and formic acid to H 2 (g) and CO 2 (g), via the action of the enzyme formic hydrogen lyase, emit gas. A rapid and simple test method for the detection of acylamidase activity of Pseudomonas aeruginosa was devised. One loopful of a nutrient agar overnight culture of a test organism was inoculated into 1 ml of a test medium consisting of 0.2% KH 2 PO 4, 0.01% MgSO 4 ·7H 2 O, 0.5% NaCl and 0.1% acetamide (final pH 6.8). Based on the 16S rRNA gene, FAME analysis and biochemical test, the isolates have been identified as Pseudomonas aeruginosa and Achromobacter sp. These have been named as P. aeruginosa strain DBT1BNH3 and Achromobacter sp. strain DBTN3. Pseudomonas aeruginosa (PsA) is the commonest organism cultured from sputum of adult CF patients, with approximately 80% of patients being infectedby the age of 18 [1,2]. Pseudomonas aeruginosa is a gram-negative, rod-shaped, asporogenous, and monoflagellated bacterium that has an incredible nutritional versatility. It is a rod about 1-5 µm long and 0.5-1.0 µm wide.